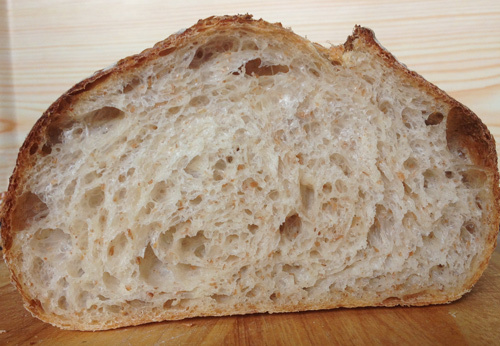 look absolutely perfect, shape, height, colour and crumb. Very nice. Thank you. The recipe is foolproof and produces consistently good results every time. I also learned some neat tricks for final shaping from the book. What's not to like Syd! Thank you da. Mind you, it only makes a good toasted cheese from the second day onward. On the first day it is too fresh and doesn't crisp up nicely. It is also more difficult to cut evenly. Happy baking to you too! Thanks so much for the post and the peek into your kitchen. I agree with you about using formulas as guidelines. I always tweak and adapt to suit my own preferences, time constraints or other limitations. But like you I also try to be true to the recipe at least once. I just found with this one there was no need to do the double hydration thing. I tried it with and without and the results were the same and it saved me the extra hassle of having to squeeze water into a dough that has already formed gluten strands. I can see this step being necessary if your flour isn't strong enough but the flour I use is fine and can handle a 75% hydration all at once. I don't really follow the times in the recipe either. I do turn the dough every 40 mins after I have kneaded it, however three turns are usually enough. My kitchen is pretty warm and I usually divide and pre-shape at the 2.5 hour mark. Sorry to hear about you not being able to eat tomatoes but even a simple grilled cheese with this bread tastes great. Beautiful crust and crumb, Syd! And the sandwich looks delicious, too! It's almost 5 months until I can expect local vine ripened tomatoes again. Then, I can eat them 3 meals a day until the season's over. Fortunately, we are blessed (or cursed)! with a very warm climate here in Taiwan and are able to get pretty decent tomatoes all year round. You do pay a premium price for the better ones, though. Very elegant and delicious trios, Syd! Haven't seen you on here for a while. 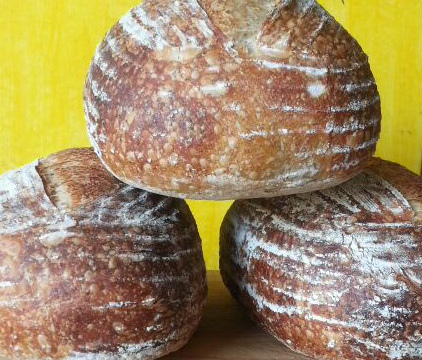 Immaculate Country breads, Syd.I've just baked the sesame version, and it looks incredibely delicious! Oh, and the grilled sandwhich is Superb! Yum. Dont get to bake much at the moment. If I am lucky, once every two weeks. Haven't baked anything new in a while which is why I haven't posted. However, I do check in every now and then and see what everyone is up to. Great to hear from you and hope all is well with your back after the surgery. I agree with Janet...do what works best for you and that's what I usually do. By the looks of your results it certainly is working. What part of Taiwan do you live in? I visit China for work 4-5 times a year and once in a while get to go to Taiwan to visit and always enjoy the trip. Yes, my philosophy is 'don't fix it if it ain't broke', however it is nice to tinker every now and then to see what different outcomes may result. What is it about a good loaf of bread that makes lobster seem just so blah! Nice work, Syd. I love the BCB. It is great for tartines (no surprise there). Great to hear from you Glenn! Okay, you got me this time. I have no idea what BCB stands for. Buckwheat Covered Bannetons, Bangladesh Cricket Board, Bacon Cheese Butty? But if you mean some kind of grilled sandwich, I agree. It makes awesome grilled cheeses, especially from day two onward. Another one of my favorites is pesto, mozzarella and salami. Hope you are well, too Glenn. What does your acronym mean?